Strabo's Geography is one of the main sources that archaeologists use for the study of the Castro Culture’s (Iron Age in north-western Iberia) customs on food and consumption. In his description, he affirms that during two thirds of the year, those mountaineers fed on the acorn. The archaeological evidence shows that these people were mainly farmers; therefore Strabo presents this idea of gathering and poor agriculture in an attempt to contrast Castro Culture with a civilized image of Rome. However, the gathered products would constitute an important part of their diet, as the common finding of acorns in a substantial number of settlements seems to indicate. "For two thirds of the year the mountaineers feed on the acorn, which they dry, bruise, and afterwards grind and make into a kind of bread, which may be stored up for a long period." Literal interpretations of classical texts, like this Strabo quote, installed the vision of a precarious agriculture during the Iron Age in north-western Iberia (VIII-II BC) among archaeologists and historians.According to them, these societies would have been eminently cattle breeders and gatherers with an incipient agriculture. This interpretation was hegemonic for decades, but through critical review of classical texts (Bermejo 1983 & 1986) and thanks to the advances in archaeobotany (Vázquez 1975, 1994; Dopazo et al. 1996) we can finally observe a much more complex reality, in which crops and forest resources management were complementary. From the Study Group for the Prehistory of North-West Iberia (GEPN), we have opened a new line of research focused on food and consumption in the Iron Age in north-west Iberia. One of our first steps in this area was the study of the operational chain of bread production in the Iron Age. Acorn bread has been subject to experimentation before, the most notable is probably the one made by Queiroga, Oliveira and Pereira in northern Portugal (1991). Following their experiments, our primary goal was the reconstruction of the acorn bread production process, paying attention to the different technical possibilities and problems, especially to steps such as extraction of tannins, grinding and baking. Findings of seeds of different cereal species are very common in north-western hill forts (Dopazo et al 1996; Parcero et al 2007). Different varieties of wheat (Triticum) are the most commonly found cereals on Iron Age settlements as of today. Others found include several types of barley (Hordeum), oats (Avena sativa), common millet (Panicum miliaceum) and foxtail millet (Setaria italica) (Parcero et al. 2007). On the other hand, there was at least three species of legumes cultivated in the Iron Age in north-west Iberia: pea (Pisum sativum), bean (Vicia faba), and vetch (Vicia sativa). The latter species was traditionally used as fodder for cattle, although ocasionally was consumed in human diet, as it suggests one of its popular names, "herba da fame" [hunger grass] (Rodríguez 1958-1961). All these legumes, as well as nuts, can be used for making bread mixed with cereal flour. Concerning nuts, archaeologists also have found evidence of hazelnuts (Corylus avellana) in Iron Age contexts (Dopazo et al. 1996), and the consumption of some species is suspected due to its presence in palinological record, such as walnut (Juglans regia) or chestnut (Castanea sativa) (Teira 2010, 142). Finally, acorns are present in a large number of settlements (See Figure 1), appearing in 41 out of 61 hill forts observed (67.21%), these nuts are mainly preserved charred and peeled. This could be the result of pre-processing for conservation or for tannin extraction, but they could have been discarded and burned. However, this wide presence in the archaeological record should be taken with caution, always bearing in mind the potential overrepresentation of acorns compared to other seeds. 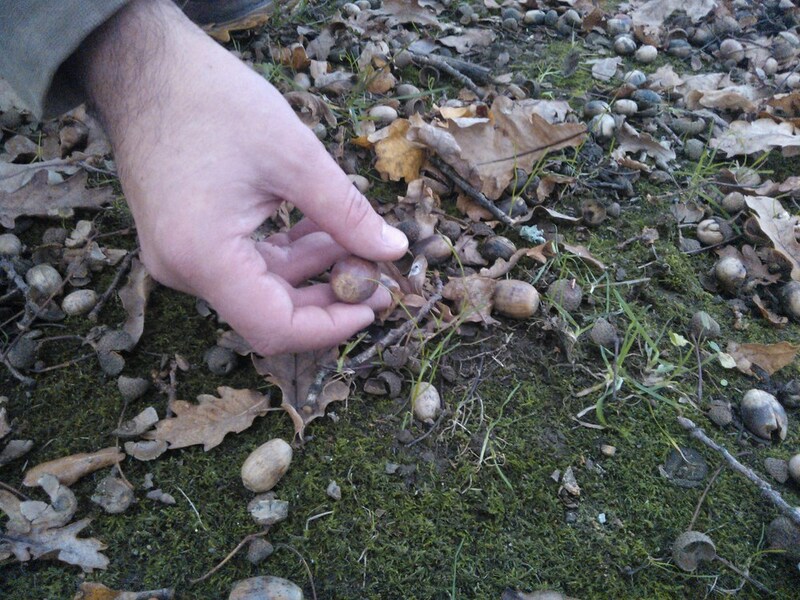 Its large size compared with other remains makes acorns easier to recover in archaeological campaigns where no archaeobotanical sampling has been planned. Fig 1. Acorn presence in Hill Forts with archaeobotanical sampling. 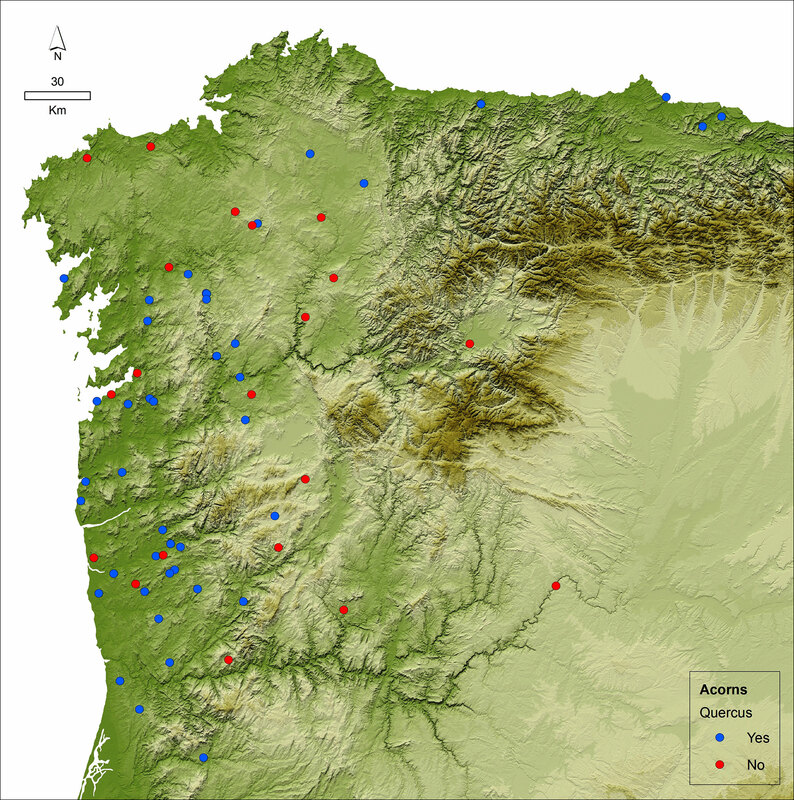 In addition to the considerable presence in carpological record, acorn remains have been found (starches and phytoliths) by microscopic analysis in mills and ceramic potsherds from sites like La Campa Torres in Gijón (Juan-Tresserras and Maya 2001), or Toralla in Vigo (Juan-Tresserras and Matamala 2003). Our experimentation for recreating and testing the operational chain of different food products begins with bread, but acorns could be consumed in different ways: simply roasted or boiled, grinded and baked into cookies, as porridge, or in stews. During the Iron Age in north-west Iberia (VIII-II BC) several species of Quercus could have produced acorns suitable for human consumption, although the most common and extended species in this area is Oak (Quercus robur). In southern Galicia and northern Portugal populations of species like Holm oak (Quercus ilex), Cork Oak (Quercus suber), Gall Oak (Quercus lusitanica), Kermes Oak (Quercus coccifera) and even Portuguese Oak (Quercus faginea) could have existed. There could have been species such as Pyrenean Oak (Quercus pyrenaica) and Sessile Oak (Quercus petraea), especially in mountain areas. This species list is based on the varieties currently in existence, because from the archaeobotanical point of view it is impossible to identify the different species of Quercus through the fruit in absence of cupule, although some remains of cork were found on some settlements like As Laias, in Cenlle, Galicia (Teira 2010, 144) according to anthracologycal record of settlements like Castrovite, in A Estrada, Galicia (Martín; Carballo, 2010), the most common and extended species were deciduous Quercus sp. (Q. robur, Q. petraea & Q. pyrenaica). Acorn gathering is a relatively simple job that takes place between September and December, although depending on the weather it can arrive earlier or later. In our view, it was only necessary to choose healthy fruit that were not attacked by pests or were rotten, but in the past they would have also collected it for reuse or as cattle feed. There are two possibilities to carry out the gathering of fruits: the first would be to pick the ripe fruit from the ground (See Figure 2), and the second would be to cause the fruit not yet fully mature to fall by shaking the branches. To make the latter method possible, pruning would be necessary to reduce the size of the trees that, in the case of oak, reach 40 meters in height. Once harvested, acorns could be transported in bags or containers of different types made of leather, fabrics, wood and basketry (Oliveira, Pereira and Queiroga 1991, 255). To preserve acorns for several months it is necessary to dry them in the sun or fireplace. 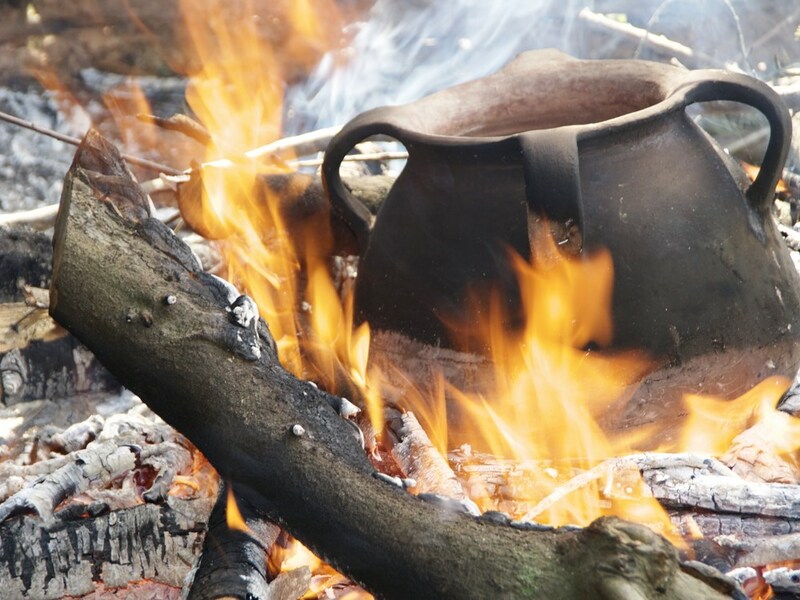 Another possibility would be the use of structures such as sequeiros (traditional buildings from inner Galicia for chestnuts drying) where the fruits could be dried over the fire by smoking. So far, archaeologists have not found any structure that suggested this use, although there is the possibility that it was built with perishable materials.Another chance would be to use the round house's attics for that purpose, using the heat of the fireplace. Once dried, acorns can be stored in the same attics, silos, granaries or placed in ceramic containers (Rodríguez Corral 2009, 75). One of the biggest problems of north-west Iberia´s most common oak (Quercus robur), unlike Holm Oak (Quercus ilex), is the bitterness of the acorns caused by tannin concentration. There are several effective procedures to remove them. One of them is a consequence of its previous storage in underground silos, which triggers a process of fermentation in the fruit causing the tannin to disappear or reduce considerably (Renfrew 1973, 154). There are two primary methods that can be carried out with the newly harvested fruit. 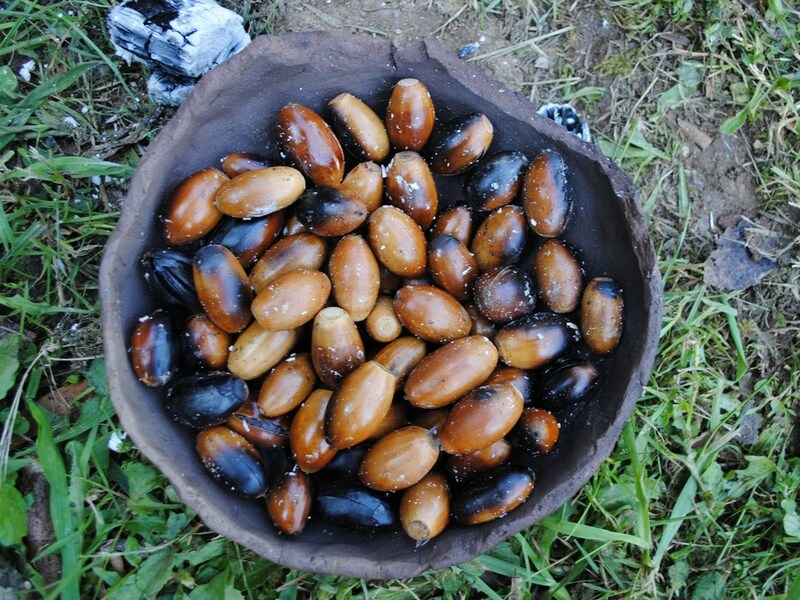 The first consists of roasting the acorns, arranging them into a container or directly on the coals (See Figure 3). This method is very useful for further conservation as it greatly decreases moisture in the fruits. Another variant of this method would be roasting them with the ashes as Pliny suggests (Natural History. 16, 7). The second method consists in scalding the fruits: putting them in boiling water for about 30-60 minutes (See Figure 4). This process softens up acorns, making it easier to grind with saddle querns. The removal of tannin can also be carried out after grinding the fruits. The Klickitat people, from the current state of Washington, after peeling the acorns, performed the milling and deposited flour in holes in the ground with a bed of pine leaves. After they scalded the flour to facilitate the removal of tannins. Finally, they washed the flour, kneaded it and cooked it into a flat bread type product (Renfrew 1973, 154-155). 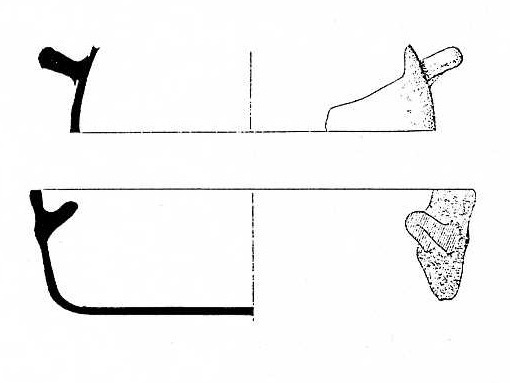 To carry out the grinding, the inhabitants of the settlements had several artefacts at their disposal, as the archaic saddle querns (See Figure 5), of Neolithic tradition, consisted of two parts. The first, the lower stone (bed stone) remains fixed. The second part, the upper stone (rubber), is mobile and smaller. The operation of this mill is based on the friction produced by the moving part against the bed stone with a swinging motion. The resulting flour in the case of cereals is relatively rough, but of course this depends on the time that was lent to the task of reducing it to the fullest and the possible removal of the posterior bran sifted through. One must add that one of the biggest advantages of saddle querns are they versatility because they can be used to grind grain and larger fruits, such as acorns. The second type of mill registered in the north-west Iron Age is the rotary quern, consisting of two circular pieces of stone, the first immobile lower stone is known by the name of meta, and an upper piece, the catillus, rotates on the first one grinding the grain or fruit previously crushed. The biggest advantage of this type of mill is saving time, since the flour obtained does not differ much in quality compared to the swing mill. It is estimated that to make a kilo of flour with a saddle quern it would take around an hour and a half, while a rotary quern could achieve the same amount in only ten minutes (Carballo, Concheiro and Rey 2003, 103). For years rotary querns were considered to be a Roman introduction. This thesis is further put into question due to the chronostratigraphic data obtained from Galician sites like Cortegada (Silleda), O Achadizo (Boiro) or A Forca (A Guarda), which date the appearance of these artefacts to the beginning of the second Iron Age, around the fourth century BC (Carballo, Concheiro and Rey 2003, 97). 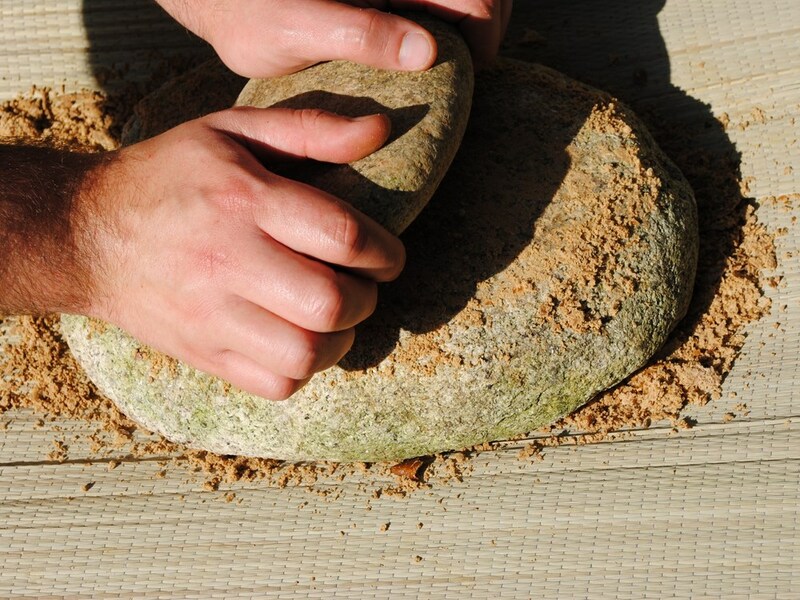 For grinding nuts, in addition to saddle querns, existed other artefacts, such as mortars and those known as stones with cups or granite tables (large granite blocks with carved cups that could be used for grinding), which appear especially in the north-eastern area of the Castro Culture, in western Asturias settlements as Coaña, Mohías (Coaña) or Pendía (Boal). (Santos 2006,). Another kind of mortar that can fit in Iron Age chronologies are known in Portugal as pio de piar os milhos (Coelho 1986, 112). This device consists of a stone, with cylindrical or conical shape, with a central cavity, as a large mortar. One possible protohistoric parallel of these artefacts exists in the town of São João das Arribas (Miranda do Douro), in north-eastern Portugal (Ferreira 2004). During our bread experiments mixing acorn flour with wheat flour, the percentages of acorn range oscillate from 20% to 50% of total volume. When blending acorn flour with wheat flour and yeast it would be possible to obtain leavened bread because of the elasticity of gluten. A higher content of acorn flour will result in more compact and less fluffy bread. The method to make sourdough is very simple: just mix equal parts wheat flour (if possible with bran) and water. After about 4 or 5 days fermenting the sourdough is ready to be used. Yeast also can be picked up from the beer, so the use of its properties was not a secret to Iron Age peoples. However, unleavened bread still remains as a plausible option, mainly if wheat is absent from the recipe, considering that millets or barley has not the same proportion of gluten than the first one. 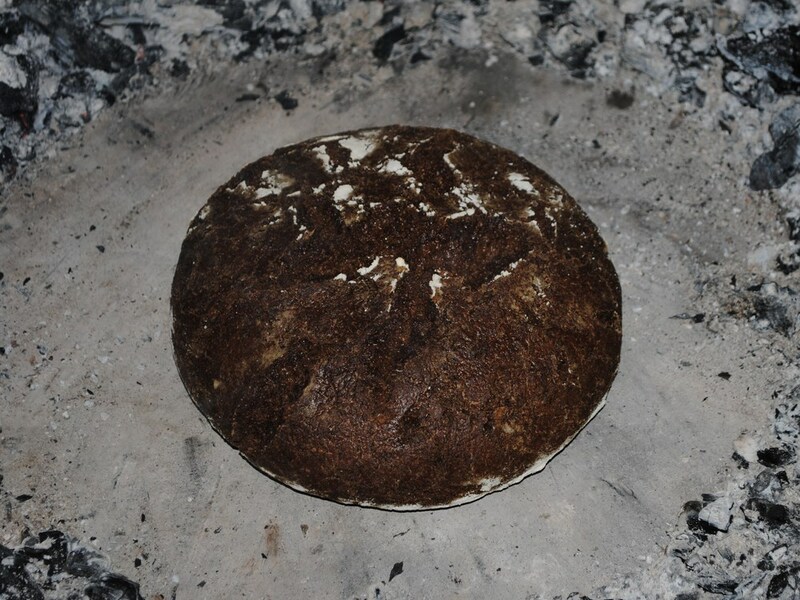 Once the sourdough is added, it is necessary to leave the dough to rise for a time of 2-8 hours in a warm place, for example near the fireplace, because yeast needs temperatures between 20 and 30 degrees to develop properly. Salt is another optional addition. Its acquisition was not difficult considering the access to the sea water or the existence of trade with producing areas such as Villafáfila (Zamora), which has been operating since prehistoric times (Valiente and Ayarzaguena 2005). Also salt could be extracted by mining, as in some areas of the Cantabrian Mountain (Fernández 1994, 137). 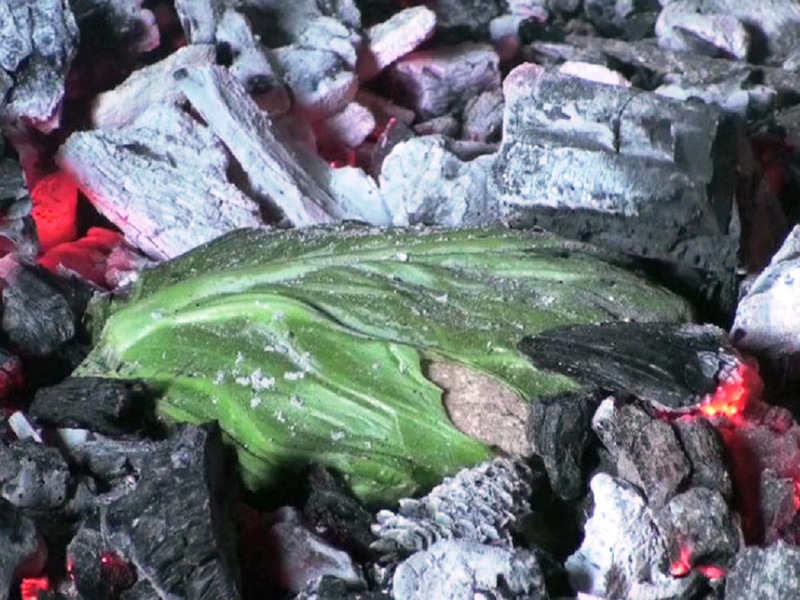 The baking of bread could be done following various methods, and we tested two of them with positive results, the first consists of depositing the dough coated with collard leaves (See Figure 6) in the coals of a fireplace. This method might have been the most common due to its simplicity and the absence of ovens in most settlements. Collard (Brassica Oleracea) was traditionally used for baking bread on fireplaces in rural Galicia. In addition, Brassica/Sinapis are present in the archaeobotanical record (Teira 2010, 141), and in organic remains analisys(Prieto et al. 2005, 197) from some hill forts. The existence of pieces such as Tipo Miño Bowls (Rey 1991), which could be used as covers (See Figure 7), led us to test similar pieces of traditional pottery, as the buleira from Gundivós (Sober, Lugo, Galicia). After heating the fireplace base, coals buleira. 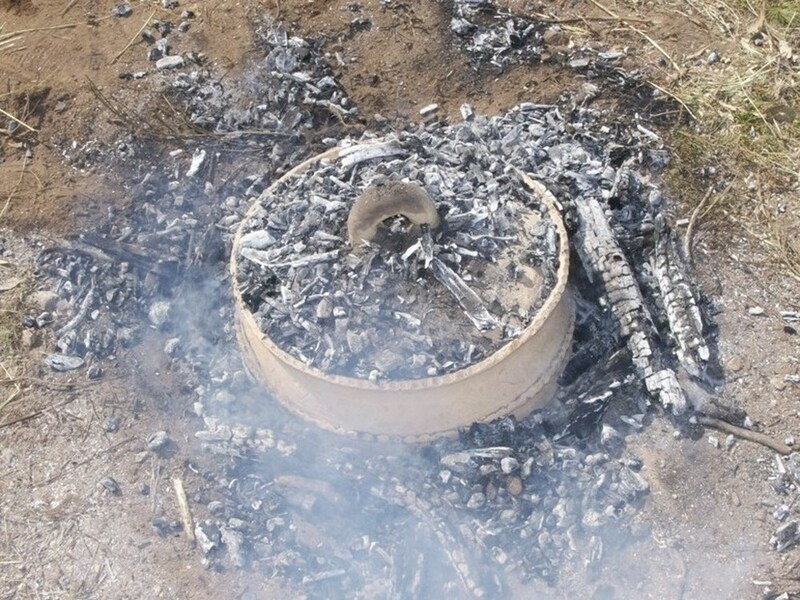 Finally coals are placed around and over the cover, creating a cooking chamber that radiates heat from all sides (See Figure 8). Another way for baking with clear archaeological evidences are the stone ovens, such those that we can found in Santa Trega, cooking in a stone oven needs, like in fireplaces, a previous process of heating, usually made ​​with a high calorific intake wood. After cleaning the oven, it is necessary to leave a few coals at the entrance to stop heat loss (Oliveira, Pereira and Queiroga 1991, 265). Once placed inside the dough, the oven would be sealed with mud or cattle excrements. After completing this step, half an hour would be enough to complete the baking process (Oliveira, Pereira and Queiroga 1991, 266), the same time as in the previous methods (See Figure 9). With regard to experimentation with acorn bread, we can draw several interesting conclusions. The first refers to the system of removal of tannin. From our point of view, both ways (cooking and roasting) are perfectly feasible in its use for specific utilitarian reasons. The biggest advantage in roasting is dehydration, something that is necessary for preservation. As for boiling, its biggest advantage is the softening of fruit, a feature that facilitates the grinding process, as well as the possibility of utilizing waste water from boiling acorns for the preparation of dyes, or tanning skins (Renfrew 1973, 155). Concerning grinding, we must say that, despite the rudimentary process, the quality of flour obtained with querns is very acceptable, which allows a proper mix of ingredients and preparation of the dough. The flour mixture carried out also confirms the observations of previous experiments (Oliveira, Pereira and Queiroga 1991). To keep a greater suppleness and elasticity of the dough, a better fermentation and a fluffy texture after baking it is necessary for a large part of the dough to consist of wheat flour. Flavour in all experiments with acorns was quite nice because the correct disposal of tannins by the procedure of roasting and boiling. In the future it would be very interesting to continue this line of experimentation, taking into account, among others, cereals very characteristic of north-west Iberia Iron Age as common millet, and checking the result of legumes as an ingredient of bread. BERMEJO BARRERA, J.C. 1983, Etnografía castreña e historiografía clásica. PEREIRA MENAUT, G. (Ed. )Estudos de cultura castrexa e de historia antiga de Galicia, Universidade de Santiago de Compostela, Santiago de Compostela: 129-146. BERMEJO BARRERA, J.C. 1986, Mitología y mitos de la Hispania prerromana II, Madrid : Akal, D.L. CARBALLO ARCEO, L.X. ; CONCHEIRO COELLO, A. & REY CASTIÑEIRA, J. 2003, A Introdución dos muíños circulares nos castros galegos, Brigantium. 14: 97-108. COELHO FERREIRA DA SILVA , A. 1986, A Cultura castreja no noroeste de Portugal, Câmara Municipal Paços de Ferreira. DOPAZO MARTÍNEZ, A.; FERNÁNDEZ RODRÍGUEZ, C. & RAMIL REGO, P. 1996, Arqueometría aplicada a yacimientos galaico-romanos del NW peninsular, valoración de la actividad agrícola y ganadera. RAMIL-REGO, P.; FERNÁNDEZ RODRÍGUEZ, C. & RODRÍGUEZ GUITIÁN, M.Biogeografía pleistocena -holocena de la Península Ibérica, Consellería de Cultura, Santiago de Compostela : 317-332. FERREIRA, C. 2004, Os píos/pilos na Terra de Miranda, El Filandar/O Fiadeiro, Publicación de Cultura Tradicional-Zamora, Publicaçao Cultural UTAD. Miranda do Douro, 15: 48-52. JUAN-TRESSERRAS, J. & MATAMALA, J.C. 2003, Yacimiento castrexo de Isla de Toralla (Vigo, Pontevedra). Análisis de contenidos de recipientes. Unpublished report. JUAN-TRESSERRA, J. & MAYA, J.L. 2001, La Campa Torres (Gijón): análisis preliminar de indicadores microscópicos y bioquímicos. J.L. MAYA Y F. CUESTA (eds. ): El castro de La Campa Torres. Periodo prerromano. Serie Patrimonio 6: 373. MARTÍN SEIJO, M; CARBALLO ARCEO,L.X. 2010, Le travail du bois et les pratiquesd’élagage à l’Âge du Fer: le site de Castrovite (Galice-Espagne) in DELHON, C.; THÉRY-PA-RISOT, I.; THIÉBAULT, S. (dir.) Des hommes et des plantes. Exploitation du milieu et gestion des ressources végétales de la préhistoire à nos jours. XXXe rencontres internationales d’archéologie et d’histoire d’Antibes. Éditions APDCA, Antibes: 343-356. OLIVEIRA, F.; PEREIRA DINIS, A. & QUEIROGA, F. 1991, O pão de bolota na cultura castreja. Paleoecología e arqueología. II: trabalhos dedicados a A.R. Pinto da Silva. Editores: F. Queiroga, A.P. Dinis. Vila Nova de Famalicão: Centro de Estudos Arqueológicos Famalicenses, pp. 251-268. PARCERO OUBIÑA C. et al. 2007, Arqueología, paisaje y sociedad. GONZÁLEZ GARCÍA, F. J. (Coord.) Los Pueblos de la Galicia céltica, Madrid: Akal, D.L., pp. 131-258. PRIETO-MARTINEZ, M. P.; JUAN TRESSERRAS, J. & MATAMALA, J.C. 2005, Ceramic production in the North-Western Iberian Peninsula: Studying the functional features of pottery by analyzing organic material. in PRUDÊNCIO, M. I.; DIAS, M. I. & WAERENBORGH, J. C. (eds.). Understanding people trough their pottery. Proceedings of the 7th European Meeting on Ancient Ceramics (EMAC´03). Trabalhos de Arqueología, v. 42: 41-48, Lisboa. RENFREW, J. M. 1973, Palaeoethnobotany : the prehistory food plants of the Near East and Europe, London, Methuen. REY CASTIÑEIRA, J. 1991, Yacimientos castreños de la vertiente atlántica: análisis de la cerámica indígena, PhD Thesis, Universidade de Santiago, Departamento de Historia I.
RODRÍGUEZ CORRAL, J. 2009, A Galicia castrexa. Santiago. Lóstrego. STRABO 1903, Hamilton, H.C. (ed. ), Falconer W. (ed. ), Geography. The Geography of Strabo. Literally translated, with notes, in three volumes. George Bell & Sons, London. SANTOS YANGUAS, N. 2006, Asturias, los Astures y la cultura castreña, Oviedo: KRK. TEIRA BRIÓN, A. 2010. Tierra, metal y semillas. Consideraciones de la agricultura de la Edad del Hierro en Galicia. Variações Paleoambientais e Evolução Antrópica no Quaternário do Ocidente Peninsular: 133-148. VALIENTE CÁNOVAS, S. e AYARZAGÜENA SANZ, M. 2005, Cerámicas a mano utilizadas en la producción de la sal en las salinas de Espartinas (Ciempozuelos, Madrid), artigo de Minería y metalurgia históricas en el sudoeste europeo, Sociedad Española para la Defensa del Patrimonio Geológico y Minero, Madrid. VÁZQUEZ VARELA, J.M. 1975, Hallazgo de bellotas en el castro de Vixil: reflexiones sobre la agricultura castreña, Boletín de la Comisión de Monumentos Históricos y Artísticos de Lugo, IX, 81-84, pp. 195-198. VÁZQUEZ VARELA, J.M. 1994. El cultivo del mijo (Panicum miliaceum) en la cultura castreña del Noroeste de la Península Ibérica. Cuadernos de Estudios Gallegos 41: 65-73.